Late last month, the Arizona Cardinals announced a new hire to the their coaching staff, someone that brings plenty of experience. Jen Welter has coached linebackers and special teams for the Texas Revolution of the Indoor Football League. She brings 14 years of professional football experience during her time in the Women’s Football Alliance, and holds advanced degrees in psychology and sports psychology. She also won two gold medals playing for the United States on two separate occasions during the International Federation of American Football Women’s World Championship within this decade. Welter will be the first woman to coach on a National Football League (NFL) team. But she’s used to blazing trails: She was the first female coach for the Indoor Football League, another men’s professional sports league. Welter was hired to that position this past February. 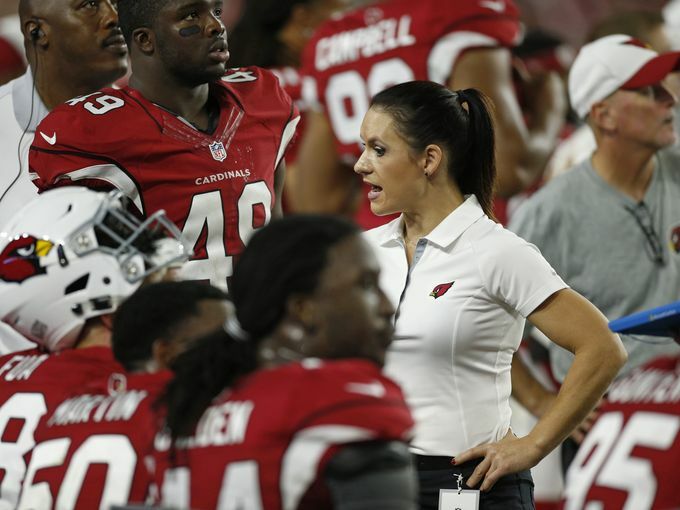 Welter will work with the Cardinals’ inside linebackers and will coach throughout training camp and the preseason as a training camp/preseason intern. It’s fantastic that the NFL is continuing to break barriers: Earlier this year, the league hired Sarah Thomas, its first female official. The two actually met during a recent preseason game.